1967 was a great year for online gaming. A strange comment considering there wasn’t an internet back in those days, and certainly no home computers, and yet the fact remains that when Fred and Peter Done created their first betting shop in Salford in the UK it was the beginning of a legacy. In the decades that followed they would continue to build their company, with a success so profound they are now recognized as the world’s largest independent bookmaker. Betfred is licensed in Gibraltar by the UK Gambling Commission under Petfre (Gibraltar) Limited, and provides the internet community with a diverse set of gaming options including sports, lotto, and casino games like roulette, slots, and poker. For the avid gambler who prefers a live casino experience, they also provide Live Roulette, Blackjack, Baccarat, and Hold’Em games, even on mobile! Their proprietary software provides an in-casino experience by using real, non-digital roulette tables, live croupiers dealing cards, all of the experiences of being in a live casino from the comfort of your living room. Betford’s Live Casino is available as a client download for your PC, or as a mobile app for your phone. You’ll experience the anticipation of waiting for the ball to drop into your number, hearing the slap of the cards as the croupier deals them out, and the joy of interacting with a live game handler, just like in a brick and mortar building! In most online casinos you’re selection of games can be quite limited, but not with Betfred. With Betfred you’ll be able to enjoy the pleasing tones and great visuals of online slots, the thrill of waiting for your number to be called in Keno, and the anticipation of the reveal of the flop, the turn, and the river in a game of Hold’Em. 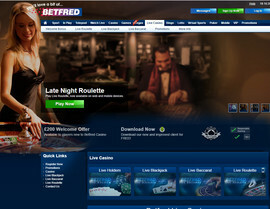 Betfred also offers a great selection of promotions to help drive your online gambling experience. Up to £200 Just For Signing Up! : When you register with Betfred, they want you to feel welcome. That’s why they match your opening deposit 100%, up to £100 when you start with as little as £5! For Their High Rollers, A Better Deal: Playing for higher stakes? When you open your account with over £1000, we’ll throw in an additional £500 to help you start winning big! Comp Points For Valued Players: That’s all of you! Every time you place a bet, even if you lose, you build up complimentary points! Once you have enough complimentary points you can trade them in for real cash to show their appreciation! Betfred values each and every one of its customers, and this is just one way they show how! DC £250,000 give-away: Whether you’re a huge fan of the bat, or sultry Catwoman on her burgling sprees, the DC £250,000 give-away is going to be a great experience for you! Play any of their 7 DC themed games and for every £10 you lay down, you’ll get a draw in their giveaway. You can even take a chance on winning double stakes by staking £10 in Batman & The Joker Jewels, Batman & Catwoman, or Batman & The Riddler in weeks one, two, and three respectively. Land Of Gold Jackpot: The Land Of Gold Slot offers a huge jackpot potential, with previous winners walking away with over £50k after an 80p bet! Take a spin on the Land of Gold Slot and get a chance to experience your own gold rush! The true casino enthusiast isn’t going to be satisfied with just being able to play at home, not in today’s high paced, on the move world. That’s why they offer a convenient online casino option for their mobile gamers. Whether you’re an avid fan of roulette, or just can’t get enough of the diamonds and spades, Betfred is there for you. Just download our mobile app to connect with our entire casino collection, from live gaming to video slots. We know that sometimes, you just need a helping hand. Family is there for each other, and they provide around the clock support for your online gambling needs. Whether you just have a question about one of their games, or have had a problem with your account help is just a quick phone call away. Prefer an email option? That’s fine, there’s always a way to contact them via several targeted email addresses. Rather than going into a general mailbox, they have one available for every type of game, ensuring they’ll be noticed quickly and handled immediately by experts on your particular gaming style. Every gaming aficionado has their preferred style, both in the games they play and in the way they choose to support their favorite hobby. Betfred offers multiple payment options to ensure that you can get involved in the way you’re the most comfortable! They accept both Visa, and Mastercard, including their Maestro and Electron options, but that’s just the beginning. Prefer an online payment source? You can use Paypal, Moneybookers, Neteller, Skrill, and even the Pay Safe Card. They know you want to play their games and stick with your preferred money management style, so they made all these options available to you every day. That’s real service. Now I may be a little biased, but really it’s hard to argue with here. Betfred just has the best options available on the web. Great payment options, tons of promotions, and a library of games that just can’t be beat. There aren’t that many options out there for live online gaming, but Betfred makes sure to meet that demand and provide multiple ways to play as well. My personal experience has found them to be fair, have good payout rates, and be quick to respond via their customer service channels whenever I have any questions. Betfred will definitely have my business for years to come, check them out today!